Tickets: £11; concessions £9. Membership for the season, which gives admission to six concerts: £50; concessions £40. Tickets and membership can be purchased at the door or in advance. The latter can be done online, making payment to Lloyds Bank, Lampeter, giving your name as the payee reference. Sort code: 30 94 85 a/c no. 00131594; when you make a payment please let our treasurer know that you have done so:carolcook377@gmail.com. Alternatively, you can order tickets from Carol by phone (01558 650569), or post: Carol Cook, Graigtwrch, Ffarmers, Llanwrda, Carmarthenshire SA40 9RN. Pythagoras proposed the intriguing idea that the Stars, Moon and Planets emit their own unique musical tones, he called it the Music of the Spheres. What if you could hear that? What if you could hear the shape of a sphere, the sound of our planets, the number Pi of as a melody, the circle of life in music? 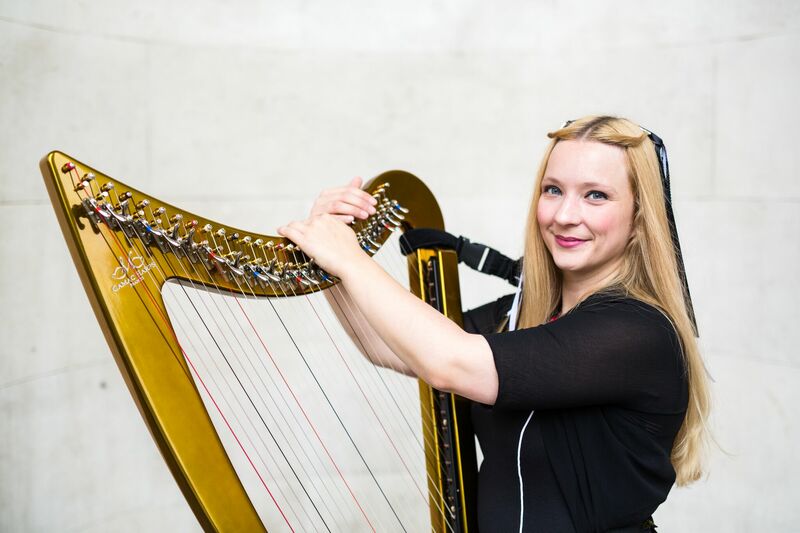 Shelley explores these fascinating notions in her performance on the Concert Pedal Harp and Electric Lever Harp. Music to include, Harp Concerto in B flat major – Handel, Pie 3.14 – Fairplay, Baroque Flamenco – Deborah Henson-Conant, Our Moon (featuring Clair de Lune Debussy and Moondance -Van Morrison) Music of the Spheres, Fairplay and El Tren Lechero (The Milk Train) Trad. Paraguay.